Are you aware of the fabulousness that Brown Baby Girl is? In case you haven’t seen it, I featured Lorenda in my 6 Questions With… entry recently. Jazz, soul and theatrics all come together through the Ying and Yang – a ball of fire named Lorenda Robinson and the cool cat Jamie Finegan. After all, there must be a balance. This duo aims for the jugular and looks to get you out of your seat by the end of their sets. Hearing Lorenda’s voice does the things it does is absolutely bonkers. And with Jamie on the keys, what more can you ask for? 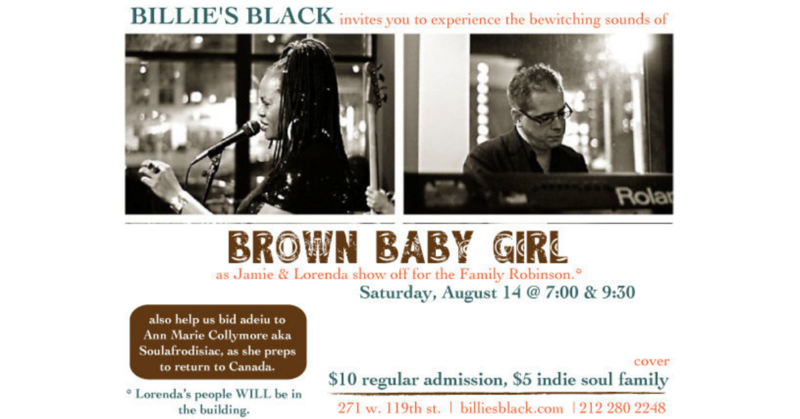 This Saturday on August 14th, Brown Baby Girl will be increasing the temperature in Harlem at Billie’s Black. They will have two sets, one at 7 PM and the other at 9:30 PM, the damage is $10 at the door. I will be tucked away in a corner taking the vibes in. Come through if you can, this is not a soiree you will want to miss out on.